How to select all the cells quickly? If you do not want to open each Excel file separately, you can open all of them at the same time. How is it possible? Just select all the files, which you need to open and press “Enter”. But what to do if you have numerous files opened in Excel, and you need to switch between them quickly? You can easily select the file you need by clicking Ctrl+Tab combination. This function is also valid in your Windows system, and can be used in various applications as well, for instance, you can use it to switch between tabs in your browser. These are very simple, but useful life hacks for everyone. Did you know that you can customize the navigation panel yourself? By default, you have three standard buttons on the quick access panel, but you can easily add the extra ones or change the existing ones if you want. How can you do this? Just select “File” section ⇒ “Parameters” ⇒ and Quick Access Panel and make it meets your needs. Very simple, isn’t it? The Excel spreadsheet consists of numerous cells, but sometimes the ones that are empty really distract you from working. What can we do then? Right, we can delete or hide them all, and it is very easy now. You just need to select the row, choose the “Data” tab and select “Filter.” Then you will see the arrow that is pointing down. By pressing this button with an arrow, you will be redirected to the menu, where you can tick the rows you need to hide. There is no magic, just five fingers discount. As you see, Microsoft Excel is not that difficult to use and, what is more, you can find a lot of free teaching videos on it available online, as well as various articles about other excel life hacks. 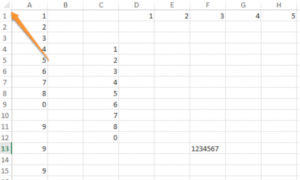 Of course, I have outlined not a full list of things you can do with excel in order to work faster and more effective. But I really hope these five top-rated tricks will come in handy when using excel for life and work. Learning something new never exhausts the mind, thus try and you will get what you need. BIO: Emma Rundle is a current prolific freelance writer, who works for https://edubirdie.com for four years. She holds a degree in Computer Science from the University of Edinburgh and she really thinks that today, computers are almost second nature to most of us. Though, in her free time she likes hiking, reading and cooking.